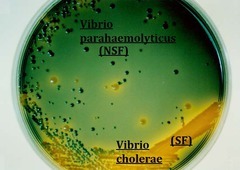 Members of the Vibrio genus are ubiquitous members of the natural marine microbial ecology. They occupy a wide variety of niches with the vast majority of strains not being pathogenic. Many of the strains that do cause acute disease are opportunistic, taking advantage of weakened and stressed hosts. To date more than 90 distinct species have been identified and characterized. There are hundreds, if not thousands of variants of these distinct species. Most are not pathogens. Controlling Vibrio loads in the environment, as one can see from their huge roles in the aquatic ecosystem is a daunting task. As a intricate part of stable ecosystems they belong there and attempts to eradicate them as a whole are likely to cause other, even worse, problems as the niches that they exploit open up for others to take advantage of.